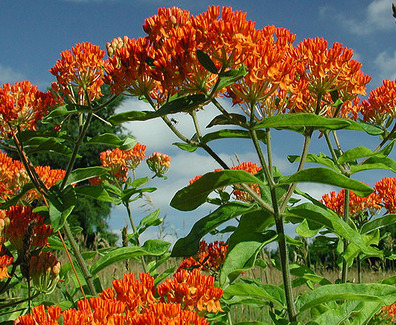 Milkweed, Asclepias tuberosa. Our species of Milkweed, one of 27 native North American species, found growing naturally from California to Labrador, Also known as butterfly plant, milkweed is the sole source of food for developing Monarch caterpillars, in fact the larvae harvest cardenolides (toxic steroids) from the plant and in conjunction with warning colouration, these substances combat predation, The flowers are brilliant orange to yellow-orange and bourne on umbels, the developed seed pods provide winter interest, Well adapted to the harsh conditions of open field succession, this plant will do well in poor soil or adjacent to a water feature in full sun positions, These plants do not transplant well so wait until frost danger has passed and plant directly outdoors, Many species of butterfly will visit this plant, If you have contemplated a native plant addition to your garden, this species is a rewarding choice. 2 top size No 1/pkg.